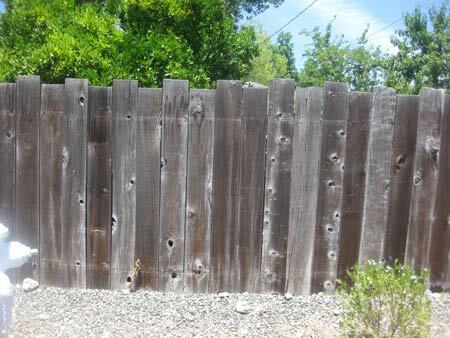 Displayed below are a bunch of wooden fence ideas I scouted out in the wilds of Sacramento and Rancho Cordova, California. Some look really nice and some do not. 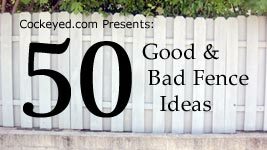 This gallery might be useful to anyone designing a fence for their yard. 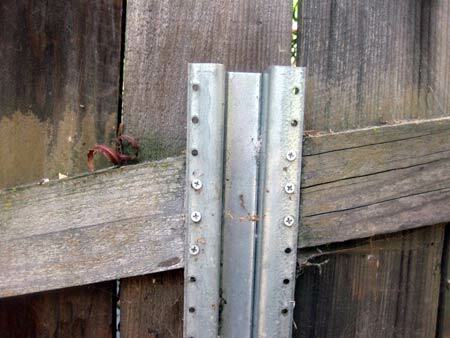 One of the concerns when building a fence is which side should you nail the pickets to? Some people consider the side where the rails are visible to be the ugly side. Other people consider the rail side to be the "inside", and feel better being on that side of the fence. 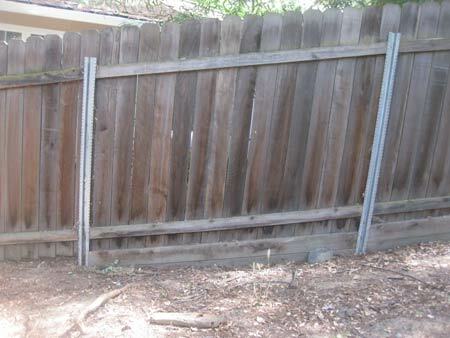 The rail side of a fence is also easier to climb over, so having the rails on your side can feel safer. 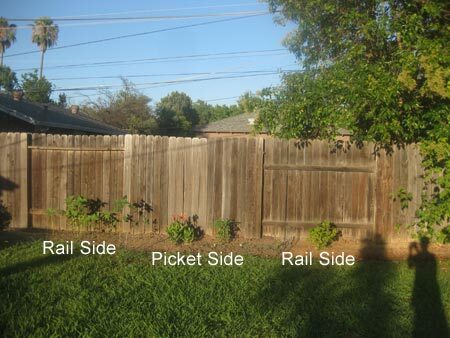 Sometimes fence designs alternate panels of picket sides with rail sides. 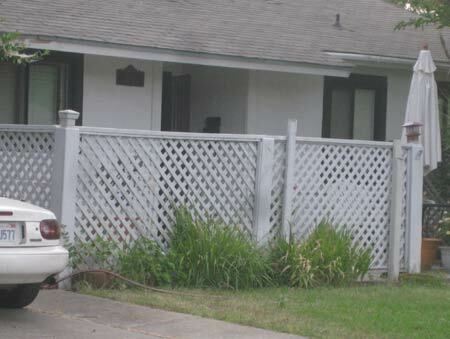 These are known as "good neighbor" fences, but I don't think they are very attractive. Another option is to alternate the fence side of individual pickets..
..but you can see right through that type of fence. 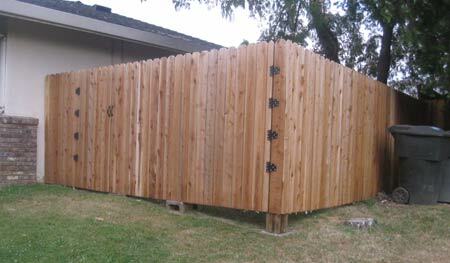 Here is a fence with flat, staggered tops. Dirt rots wood. It provides an easy, direct path to the wood for insects and water. 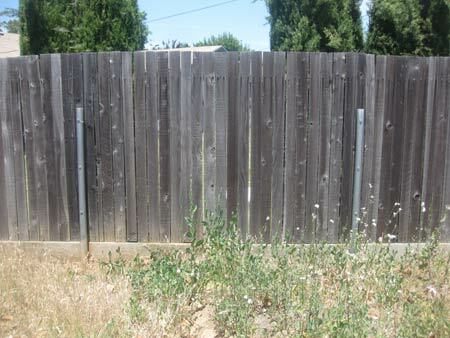 This fence is supported by steel poles instead of wooden posts. 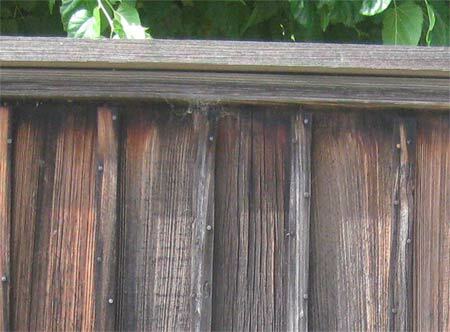 These can last 100 years or more by eliminating the wood/dirt contact of the fence. Unfortunately it is hard to make them look nice. 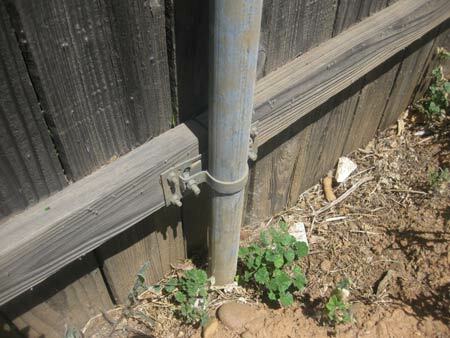 The poles cost $17 and the metal pole-to-fence brackets, called "pipe grip brackets" cost $2.84 each. 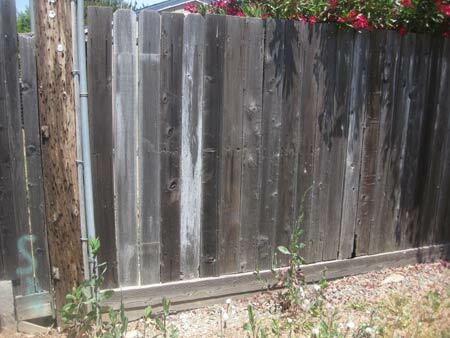 Here is a fence with a long, horizontal "weed board" running along the bottom of the fence. 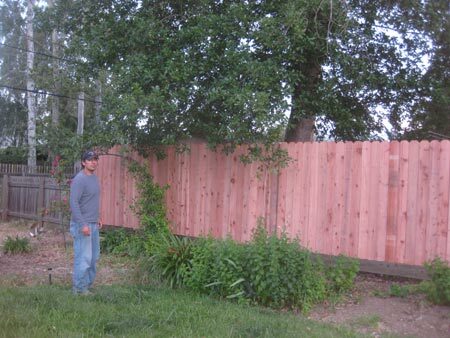 This adds a little height and keeps the individual fence pickets off of the ground, protecting them from rot. The weed board might have to be replaced in 10 years, but that will be one $6 board instead of 25 $2 pickets. 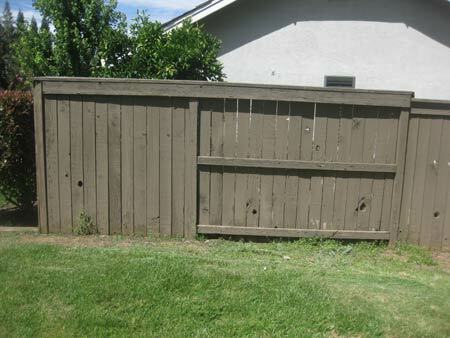 The weed board can also help in building a fence that is level. Note that a second board was added below to compensate for the uneven ground. A flat-topped fence with cement footer and metal posts. I'm not sure how the rails are connected to the posts, but this fence will last forever. Here's a fence on a hill with a giant gate opening. Ideally they would have a weedboard covering the gap between the ground and the bottom of the fence, but maybe the wheels of their boat trailer kept getting caught on it. You can tell that this is a new fence because the lawn underneath hasn't yet died. 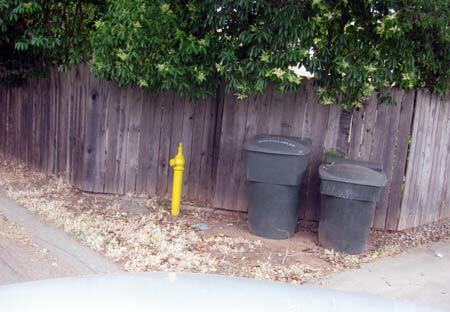 Here's a fence which makes a couple of 45 degree turns to avoid fencing in a hydrant. It looks pretty good. 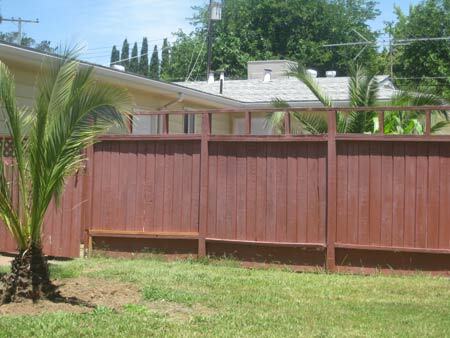 This latticework fence creates a semi-private area in the front yard. Home Depot sells these panels prebuilt in redwood or cast in plastic. This fence has a nice little design on the top. Fences with a rail along the top usually look pretty great. This one uses a double-row of pickets to completely block a view inside. There are two ways down a hill, either with stair-steps or in a continuous slope. In either case, the metal rails are plumb, straight up and down. These metal rails are premium fencing material, at about $25 each. The rails probably had to be custom cut to remove a little 10 degree wedge. 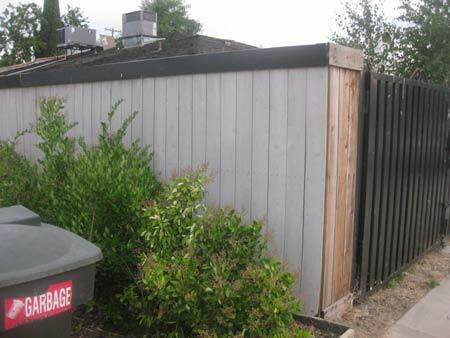 Here's a fence in a planned community. Its got three rails, good-neighbor panel-switching and a cap on three sides. 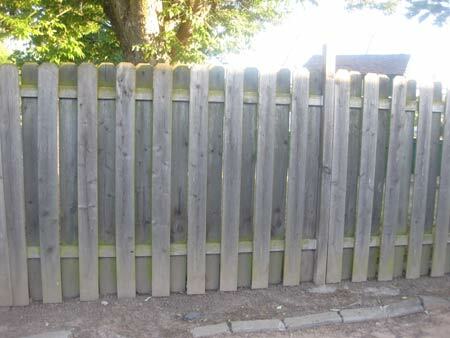 This fence used sheets of plywood which were then covered with pickets. 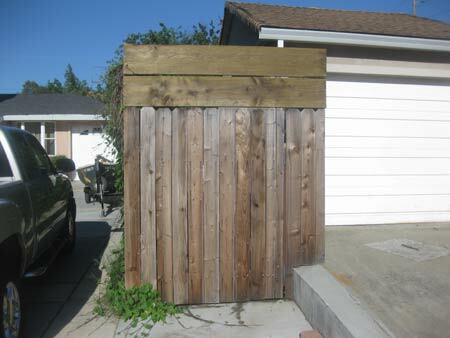 It was definitely private, and the cap on top made it look pretty good, but I think plywood is a bad choice to use in a fence. 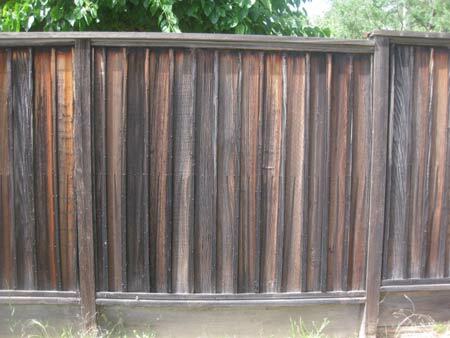 An old, attractive fence. 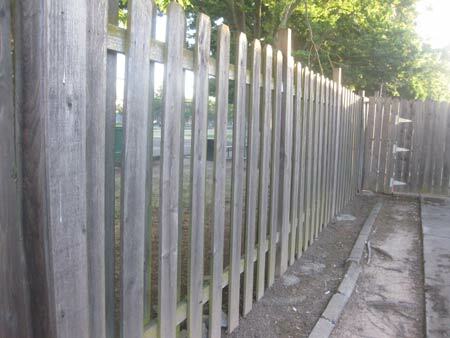 Tiny wooden battens were nailed in to cover gaps between fence pickets. Tiny details made from slender bits of wood seem susceptible to weather damage, but they appeared to be holding up well here. 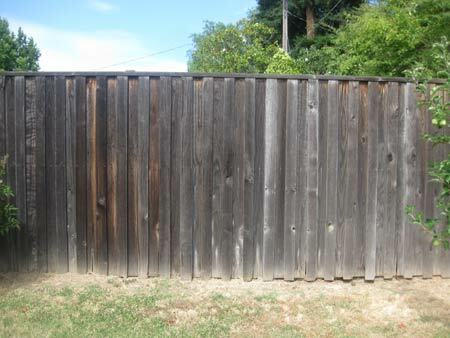 This fence owner appears to have added extra height by adding two rows of horizontal board at the top. This provides protection from rain falling on top of the fence.